I had heard ‘stories’ about treasures found in second-hand shops before. The way it goes, one day the author is browsing through the racks while his girlfriend tries on shoes, and all of a sudden he discovers an Anderson & Sheppard suit in exactly the right size. It seemed a little unlikely. Nevertheless, whenever I happened to be in any vintage shop (as second-hand has rebranded itself) I usually skimmed through the suit racks. For the sake of speed, I simply ignored any jacket where I could see a label, as a Savile Row suit will only ever have its label on the inside of the pocket. A few years of (half-hearted) searching had turned up nothing. So my heart leapt when I was doing the normal skim in a vintage shop in York and found a tuxedo without a visible label. An exploration of the inside pocket found a tag bearing the name Lesley and Roberts, of Hanover Square. I’d never heard of them and passed on. That evening, some research online discovered Lesley and Roberts listed with the address 20 Savile Row. Turns out the firm was bought up by Welsh and Jeffries (famously of that address) in 1999. I should have known that really. And Lesley and Roberts has a sterling reputation – tailor to Bing Crosby and much of the UK entertainment business in the forties and fifties. Two quick calls followed. One to the shop (Priestley’s, which I have written about before) to reserve the suit and ask what name was written on the label. Then a second to Welsh and Jeffries, to confirm the Lesley and Roberts heritage and, as excitingly, to inquire whether the firm had ever made suits for UK film director Michael Powell. For that was the name on the tag – made for Michael Powell, Esq. in March 1955. Given that only a precious few could afford Savile Row bespoke in those days (a smaller proportion than today, which may surprise some) and the firm’s heritage with the entertainment industry, it was worth asking. And yes, Michael Powell was a client. Welsh and Jeffries couldn’t confirm that he was the only client by that name, because the full book wasn’t inherited with the takeover. But close enough. So, the suit. The first thing you notice is the weight of the cloth. Heavier than even my winter flannels or tweeds. Then you notice the facings on the lapels of the jacket and waistcoat: silk rather than satin, which actually seems rather matte compared to modern suits but has greater texture and depth to it. The trousers are very wide with a very high rise. With a fishtail back, they are designed to sit on your natural waist (around the belly button if not above) and be worn with braces. Once you put them on with the waistcoat, you realise the real point of pleats. Four elegant pleats enable the trousers to get up over the hip bone and come to a very narrow waist – you just couldn’t do that with flat fronts. 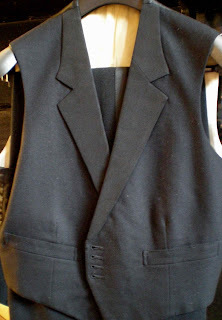 Combining that silhouette with a short, cropped waistcoat creates a very exaggerated shape (indeed, in Brideshead Revisited the heroes have suits from Lesley and Roberts with a “wasp waist”). As the natural waist is the narrowest part of most people’s bodies, having your trousers there produces the biggest contrast with the width of the shoulders. It doesn’t half make you feel buttoned up when you wear it though. The trousers are all-encompassing and my shirt has a strip of elastic to button into them. 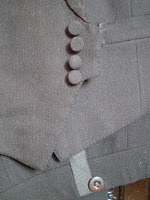 Plus, the tailor that altered them for me (Graham Browne) added another strip of elastic behind the waistcoat to button into the trousers, to make sure no white shirt ever peaked between the two. Oh, and of course you have to take your jacket and waistcoat off in order to go to the bathroom, as the braces are hidden beneath both. Quite a palaver. But then £150 for a bespoke-quality suit (plus alteration costs) is pretty impressive value. The hand detailing is impressive, particularly around details like the buttonhole. 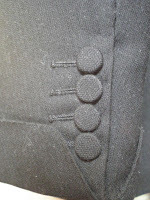 Sewing a neat buttonhole in corded silk is not easy, particularly when the slit is not parallel to the cords. Indeed, that is one reason many tailors do not put them in today. The only thing I would change is the lapels, which are notch rather than peak. Having emphasised to a reader named Paul last week how the peak harks back to the tradition of tails, this feels like a failure. But I’ll just have to swallow my pride and accept that fashions come and go, even on Savile Row. You can follow the discussion on My 50-year-old black tie by entering your email address in the box below. You will then receive an email every time a new comment is added. These will also contain a link to a page where you can stop the alerts, and remove all of your related data from the site. Great read Winston, and I couldn’t help but feel envious – thrift shop trawling is decidedly less rewarding in Australia. 1. I couldn’t help but wonder how many amazing jackets that might have fit well you’ve passed up by using a lack of a label as an inclusion criteria! 2. I believe you might be referring to ‘grosgrain’, instead of ’silk’, when you were describing the lapel facings on the jacket. ‘Satin’ is a type of weave, and is made in many materials – silk included. Aaron, thanks for your comments. Wrong author though – this is Simon. I think I got rather pessimistic about vintage after a while. Nothing but jackets from Next and Burton. Which is why my criterion became so harsh. I do indeed mean silk grosgrain. My impression is that satin is rarely made from silk these days, and as such has become synonymous with nylon or polyester. But do correct me if I am wrong. Barima, I think that’s fair comment. I did wear it last week (Graham Browne impressively performed three alterations in seven hours to have it ready in time). But I failed to take any pictures. I promise I won’t forget next time. 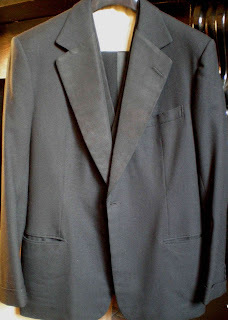 Do you know, I felt lucky looking through a Salvation army store here in Sydney, and finding a three piece DB gray suit that fit me. Or almost. (Being 20, second hand is the only sort of suit I can afford). I’m traveling to England in July; and will spend many an hour vintage shopping. Here’s hoping I find something from Savile row. (Not likely.) Here, a three piece suit comes along once every year of committed thrift shop trawling. A man who calls himself “Giuseppe” has a great blog based on thrifting called An Affordable Wardrobe. You might like it, though at times it might be too preppy for your tastes. I’ve been curious about this question, and I’d be interested to know what you base this on. I dug up a New York Times article from 1960 which estimates the price of a suit from a major Savile Row house as about US$200, which an inflation calculator says is approximately US$1,440 today. But of course the distribution of incomes has changed, etc. I was told that by an elderly tailor here in London. The point is that average incomes have gone up so much that those kind of products are accessible to far greater proportions of the middle classes. It is less to do with inflation and more to do with income growth. In the same way people complain today about it being hard for couples to get on the property ladder, yet it was inconceivable 50 years ago that someone would buy their first house in their 20s. Back then people in the middle classes may buy Savile Row suits but they would never own more than one or two and not until they were at the peak of their earning power (at least in their 40s). I’ll try and dig up more information on the subject. L&R also figures in Brideshead Revisited. Sebastian Flyte wears it, not because he was a client, but because he filched some clothes from a friend who was. Also, Powell was not at the Oscars in ’43 due to wartime travel restrictions. The statuettes were shipped to him and Pressburger. Due to wartime material restictions, the statuettes were made of plaster, and travelled poorly. So, instead of Oscars, Powell and Pressburger found they had recieved boxes of plaster dust. Having trailed the internet for information on Lesley & Roberts tailors,I came across your article with much interest. They being Bing Crosby’s tailor… My dad made the jackets while another did the trousers. I still have the ‘job’ tickets to confirm this. They were also tailors to Prince Micheal of Kent back in the late 40’s early 50s’. He was an apprentice and journeyman tailor with them all his life until he died in 1975. The picture of the label was a familiar sight and I remember seeing jackets in various stages with such acurate stitching. He would look at ‘off the peg’ suits and thoroughly pick them to pieces, and always make his own high standard suits.Thanks for bringing back memories,I still use his shears today. My grandad William Robinson was the cutter at Lesley and Roberts for many years and often spoke of Bing Crosby, Nubar Gulbenkian, Leo Genn etc. On subject of bespoke garments. I bought a sports jacket from a charity shop in Gosforth, Newcastle upon Tyne. Beautiful cloth, style and a perfect fit, but no label of any kind I cold find. I had lost weight and was having a jacket taken in by a retired master tailor who still does a bit of work from his house and mentioned the jacket to him. He told me to bring in along and it was out of its suiter for less than 5 seconds when he informed me if was by Douglas Hayward and dated from when he was alive. I sat him down before I told him it cost me £7.50. After this conversation, I felt so guilty I donated £50 to the charity. A few basic questions and requests. First, as I understand it, bespoke is meant to impeccably fit the person the suit is crafted for. The quality of the work aside, I am curious as to why you would look for a bespoke suit not made for you, and have it altered. Further, why is it claimed that a well-cared for bespoke suit can be handed down, when it is made to fit the purchaser/first owner? Wouldn’t procuring such a suit be comparable to buying any number of Huntsman/Isaia/G&H/etc. RTW numbers on offer, that boast a lot of handcraft in their products, and having it tailored? I am under the impression that that would just be an expensive exercise in RTW with none of the benefits of MTM and certainly not bespoke. Secondly, I am a law student in NYC. I am not happy with the fit and workmanship offered by my current suit and shirt “custom/MTM?” tailor. However, I don’t believe I can/should shell out the $4000-5000 for Logsdail at this stage. Could you make a definite post on NYC MTM and bespoke suit tailors and shirt makers; organized by price and style (British/Neapolitan) perhaps? Buying or inheriting old bespoke is about workmanship rather than fit. I’d always say that fit is the more important, but a bespoke suit will also have loads of craftsmanship that you will never get in RTW, such as a hand-padded chest. Thank you Simon. I’m eagerly awaiting the NY bespoke and MTM post. I agree totally with you on the lapel style a dinner jacket should have. A peaked lapel is a must. So I was surprised that even Savile Row has made dinner jackets with the common notch lapel. I was even more surprised to watch HRH Prince Philip, Duke of Edinburgh wearing a dinner jacket with notch lapels when he attended the state banquet together with his wife, HM The Queen, during their official visit to Germany in Berlin. Considering the formality of the event and the fact that decorations were worn this kind of lapel made the otherwise perfect dinner jacket just looking strange. I think Alan Flusser is right when he thinks that the industry is promoting the dinner jacket with notch lapels to save costs. However, this is no consideration for a bespoke jacket, especially one made by a Savile Row tailor. Even today male royalty can and should be role models. They have more opportunities to wear formal wear than most other men and they can employ the best tailors. I am quite sure that it was not the prince consort who wanted expressly that kind of lapels. It is sad to see well-made dinner jackets in styles that are all wrong, because some designer wanted to try “something new”. The dinner jacket of today is one of the very few things that has reached its optimum in design. Change means usually making it less than perfect, maybe with the one exception of side vents. They are actually not correct but because they can help to minimize creases after long hours of sitting there is some practical value in having them. The wearer of a dinner jacket with notch lapels however gains not even an additional notch of comfort in comparison to another man who wears the correct peaked lapel. So please don’t stop to tell men how to look their best when black tie is wanted.